Sterling silver pendant inlaid with dinosaur bone, opal and coral. Our Products >> Silver pendant inlaid with dinosaur bone, opal and coral. Silver pendant inlaid with dinosaur bone, opal and coral. 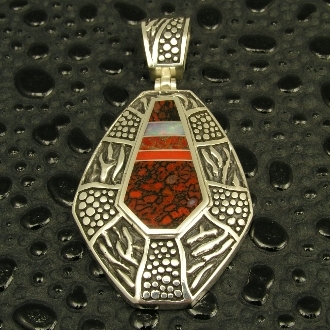 Sterling silver pendant inlaid with two types of dinosaur bone, red Australian opal and red coral. Dinosaur bone is red celled with black matrix and red-brown with a gray matrix. This Utah dinosaur gem bone came from the Colorado Plateau and was a living animal during the Jurassic Period around 144 to 208 million years ago. The inlaid Australian opal fires red, green, blue and yellow. Lower areas of the silver have been oxidized black to accentuate the highly polished details. The pendant measures 34mm wide and is 63mm long including the hinged bale. The bale will accomodate most chains and smaller beads. Pendant is stamped sterling and signed "MMH" on the reverse.